Are you looking for of a new range of products to complete your portfolio in the field of building construction and to position yourself in the early stages of each project? 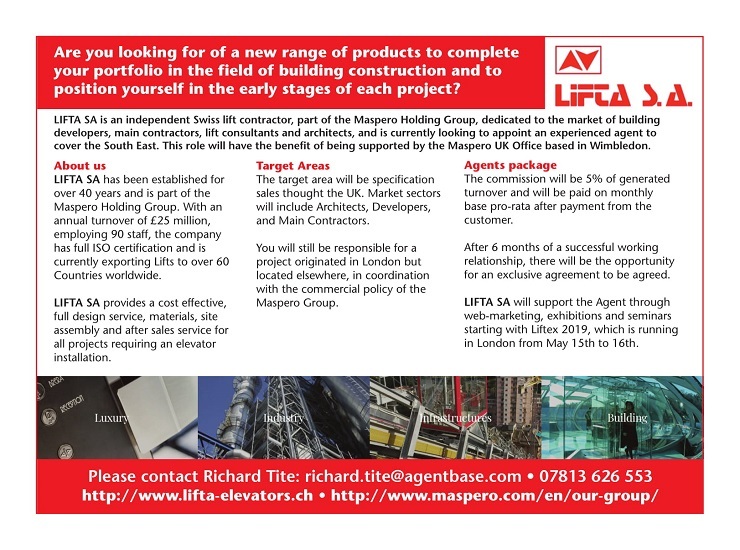 LIFTA SA is an independent Swiss lift contractor, part of the Maspero Holding Group, dedicated to the market of building developers, main contractors, lift consultants and architects, and is currently looking to appoint an experienced agent to cover the South East. This role will have the benefit of being supported by the Maspero UK Office based in Wimbledon. LIFTA SA has been established for over 40 years and is part of the Maspero Holding Group. With an annual turnover of £25 million, employing 90 staff, the company has full ISO certification and is currently exporting Lifts to over 60 Countries worldwide. LIFTA SA provides a cost effective, full design service, materials, site assembly and after sales service for all projects requiring an elevator installation. The target area will be specification sales thought the UK. Market sectors will include Architects, Developers, and Main Contractors. You will still be responsible for a project originated in London but located elsewhere, in coordination with the commercial policy of the Maspero Group. The commission will be 5% of generated turnover and will be paid on monthly base pro-rata after payment from the customer. After 6 months of a successful working relationship, there will be the opportunity for an exclusive agreement to be agreed. LIFTA SA will support the Agent through web-marketing, exhibitions and seminars starting with Liftex 2019, which is running in London from May 15th to 16th.